Strength Basics: Is there an optimal training weight for technique? Is there an optimal training weight for technique? First off, let me just say that exercises are not moving weights or resistances. They are movements you do to improve specific physical qualities. You add resistance to them to force your body to adapt to doing that movement under a load. Exercise is about movement quality, not lifting weights. I say that yes, there is. In my experience there is a sweet spot in training. Just enough resistance to force you to do the exercise correctly, but not so much resistance that you can't, and enough to get a training effect so you improve. That's a mouthful right there. If the resistance is too low, it doesn't matter if you perform the exercise correctly or not. You will still be able to execute the movement. For example, pick up a tennis ball off the floor - does it matter if you do a one-legged "golfer pick-up" or squat down and get it or round your back and lift? No. Any technique will do. You don't need to brace your core, you don't need to be aware of your breathing, you don't need to be sure you are gripping it correctly. All of those will help, but they aren't necessary, which means you have to be 100% focused to make them happen. Your body conserves resources and won't expend them when they aren't needed. If the resistance is too much, you can't perform the lift correctly. One of two things will happen. Either it will just fail - the bar won't come off of the floor, you won't reach the top of the box you are jumping on (ouch! ), you won't move the pedal on the spin bike. Or it will succeed only by modifying the technique to get it do - you round over and try to yank the bar up to get it moving, or you do a one-legged hop to get on the box, or you'll stand up and lean all of your weight into that one pedal. Either way, you are no longer performing the exercise. You are either failing to perform anything or performing some new, bastardized version of the exercise. However, there is a sweet spot between them. In the sweet spot, you have two things going for you. First, there is enough resistance that you are challenged to do it correctly. With effort and attention, you can perform the exercise in good form. Second, you have enough resistance that your body must adapt to the stimulus and get better at the movement under load. You are thus practicing the movement and getting enough resistance to improve the qualities you are after. The "effort and attention" bit is worth repeating. If you can get perfect technique without a lot of effort, in my experience it's not an optimal load. You should have to work to get perfect technique. It should take coaching (from yourself or others). It should take attention. It should take focus. It should demand all the little things you want in a perfect rep - good breathing, psychological drive, shutting out of distractions, and tightness. Again, no so little that you can let these slide, but not so much that they aren't sufficient to get the job done. Ideally, the resistance will be such that you are going a training effect (meaning, you are getting better/stronger/faster/more endurance/more mobile/whatever) and that you will improve rep after rep. This means that set 1 isn't going to look as nice as set 2. Set 3 should look nicer than set 2. Or even just reps within the set. This is regardless of the number of reps - 3 singles, 5 doubles, 3 sets of 10, or 1 set of 100. The last rep of the last set (or even each set) might not look as beautiful as the rep before it. But overall, you are getting better each time. You don't want a long series of grinding reps, sloppy execution, and loose technique. You don't want your technique to get worse over time. If it does, the resistance is too heavy, or the time too long, or your endurance just isn't up to the volume. Heavy enough to force adaptation, light enough to improve technique continuously. 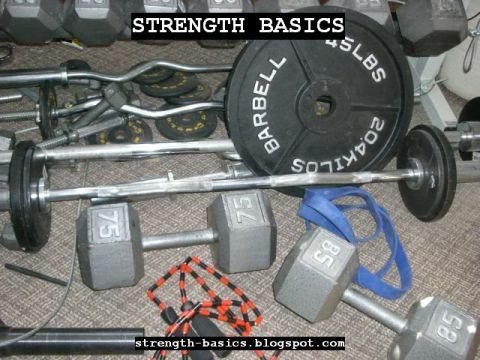 Strength training is practicing movements under load. If it's too light, raise it. If it's too heavy, lower it. It's not about doing the maximum you can, it's about doing the optimal amount. Your body will improve the most under an optimal load. Your technique will improve the most under an optimal load. Generally I find that for some clients, the optimal load is a bit heavier than they think but not as much as they'd like. For clients training on their own, I tell them to err on the side of lighter reps but to concentrate on getting the most they can out of the lighter weights. But it takes some feel - you need to know what good reps feel like. Good coaching, a good training partner, or just taking video you can review right after the lift will help immensely. Find that optimal resistance, work on your technique, and the results will come in over time.